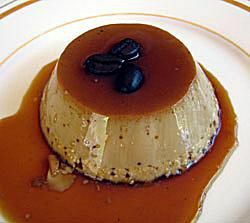 Coffee Flan - Flan de Cafe. Lisa Sierra (c) 2009 Licensed to About.com Inc. This easy flan recipe is a variation on the classic Spanish vanilla custard called "flan" in Spanish. Espresso coffee gives this flan a wonderfully rich flavor, making it a perfect dessert to enjoy with a glass of after-dinner liqueur. This flan recipes makes 6 servings - yields 6 individual servings in ramekins. Wipe out the ramekins to ensure that there is no dust in them. Set in a large glass baking dish (9-inch x 13-inch). Heat 4-5 cups of water in a pot for the water bath. Put a heavy skillet or saucepan over medium heat for 30 seconds. Add 1/2 cup sugar. With the back of a wooden spoon, keep sugar moving constantly until sugar is completely melted, and of a rich medium brown color (caramelized). Carefully spoon caramelized sugar into each of the 6 ramekins or large dish. Pre-heat oven to 325F (162C) degrees. Scald milk and cream in a saucepan. (Keep a close eye on the pan, so it does not boil over.) Remove immediately and stir in the coffee. Meanwhile in a mixing bowl, beat slightly 3 eggs. Mix in 1/4 cup sugar. Stirring constantly, gradually add hot cream mixture to egg yolk mixture. Stir until the sugar is dissolved. Blend in vanilla extract. Ladle mixture into ramekins. If the water level does not reach 3/4 of the way up the sides of the ramekins, carefully pour more water in. Bake uncovered in water bath for 50-60 minutes, or until a knife comes out clean when inserted half way between center and the edge of dish. Note: To ensure the custard does not over-cook, check doneness after 45 minutes, then every 3-5 minutes. Carefully remove each ramekin from the water bath. Set on a cooling rack until lukewarm, then chill thoroughly in refrigerator. This usually takes at least 1 hour. When ready to serve, un-mold by running a knife around the inside edge of baking dish. Place a small dessert plate on the top of the ramekin. With one hand under the ramekin and the other on top of the place, turn over. Tap the ramekin and the flan should drop onto the plate. If it does not, carefully “prod” the flan out of the ramekin with a small paring knife. It should slide out of the ramekin onto the plate. Garnish with the whole coffee beans and serve.